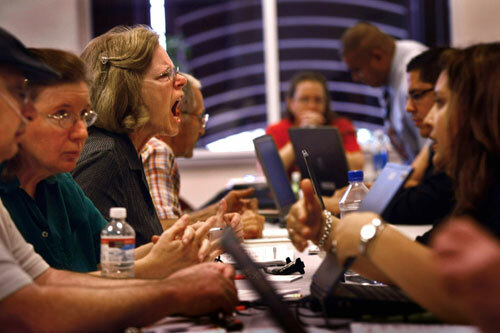 Barbara Daily shouts at a representative from American Home Mortgage Services, Inc. at a housing fair on August 22, 2009 in Thornton, Colorado. The event brought lenders and distressed homeowners together in order to renegotiate mortgages and possibly avoid foreclosures. Daily, who's home in Commerce City had been foreclosed upon by AMSI, came to the housing fair to ask the lender for more time in order to sell it, which they eventually granted.